The new SFW Series of DC-to AC inverters for CCFL backlights are designed for display applications that require high efficiency, wide range dimming and lamp current stability over a wide input range, with full RoHS compliance. They offer an extremely low profile (< 6 mm high), with wide input voltage and wide range PWM dimming. The latest in ERG’s Smart Force™ family of intelligent power solutions for display backlighting, and the first in ERG’s new SFW Series of DC-to AC inverters, these are feature-rich, highly intelligent inverters with open lamp detection, onboard PWM dimming, and lamp current regulation. Available in single and dual-lamp versions, they feature a ruggedized transformer that has helped these inverters test successfully at very wide temperature ranges. 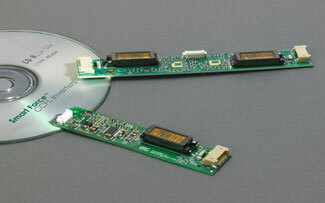 LCD's 12.1" to 19" diagonal, for a wide variety of industrial LCD applications. • Operating Temperature Range of -30º to 70ºC. For more detailed technical information right now, read The ERG SFW Inverter Series, a new white paper in the Technical Resources section of this web site. For a complete listing of all of our products, please Click Here. The SFW inverters can be used in LCDs 5.7” to 12.1” diagonal in single output configurations for a wide variety of industrial LCD applications. Call ERG at 800-215-5866 or 607-754-9187 or E-mail us at sales@ergpower.com or fill out the info request form.